This photograph, taken from the top of the tower in Ziegler’s Grove during the 1913 Veterans Reunion, shows a Trolley “inbound” (going towards the town of Gettysburg) on the Emmitsburg Road. The houses to the Trolley’s right (north) are in the area where General Pickett’s Buffet and McDonalds are located today. The trolley bed that we discussed in Part 2 of this series is shown in the bottom of this view. On that Trolley bed, the cars would have gone “outbound.” This photograph is courtesy of the National Park Service. This view was taken facing northwest in June or July, 1913. We are continuing our series on the Gettysburg Electric Trolley, which existed from 1893 to 1916. 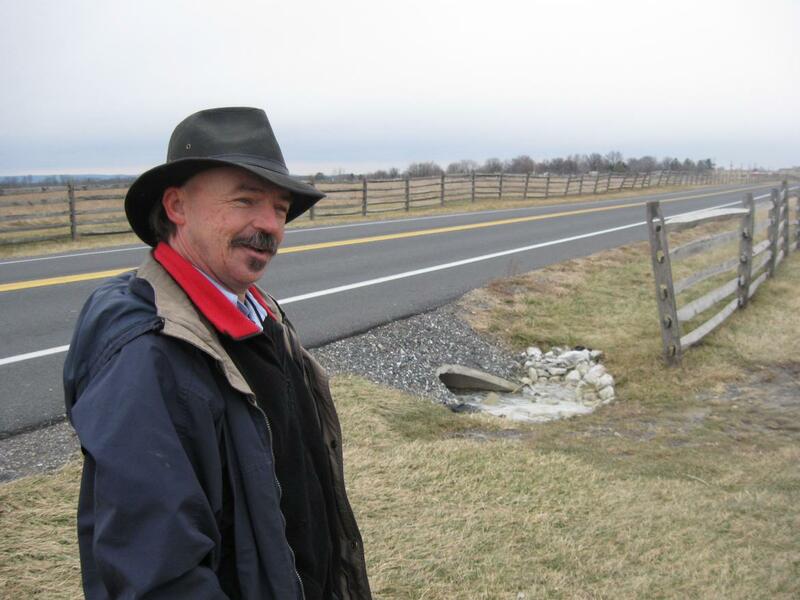 In our first trolley post, Gettysburg Licensed Battlefield Guide Rich Kohr took us from the Electric Power Station in the town of Gettysburg, over Cemetery Hill to Evergreen Cemetery. In our second post, Rich took the trolley out of Evergreen Cemetery, around the area of the “old” National Park Service Visitor Center, and showed how it was not allowed to continue along its proposed route on Cemetery Ridge. Today’s post shows that because the trolley couldn’t travel on Cemetery Ridge, the “outbound” route needed to go to the Emmitsburg Road, where there were some other options. This map shows the route of the trolley. The red line is the trolley route. 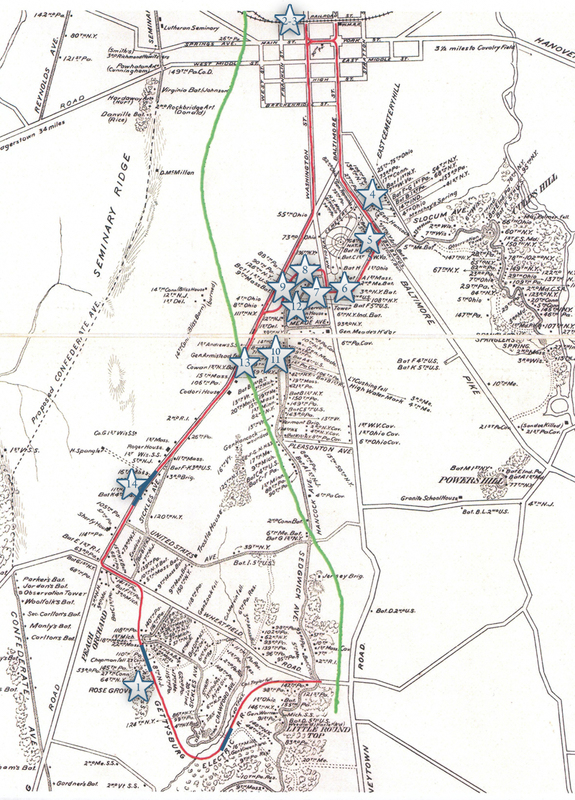 The green line is the route of the Gettysburg/Harrisburg/Reading Railroad. For some time, the trolley used the Gettysburg/Harrisburg/Reading Railroad line from the Emmitsburg Road to Little Round Top to help establish a circular route on the battlefield. 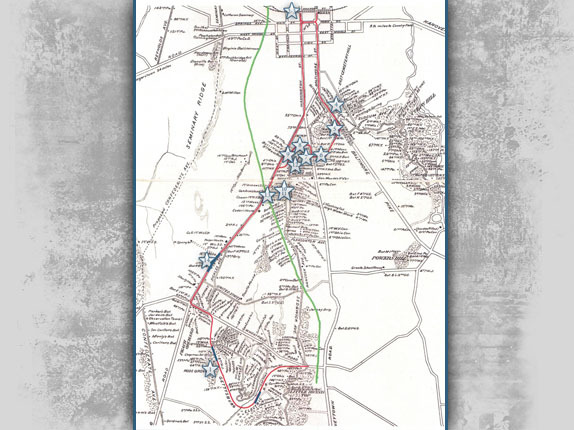 The blue sections are where the trolley had double or passing tracks. The white stars are the locations where we filmed videos, which we have numbered. Today’s post features videos #s 12-14. This map was created at approximately 9:30 PM on Monday, January 26, 2009. The cameraman is standing on Hancock Avenue. Rich is standing just west of the avenue near a marker to the 107th Pennsylvania Infantry Regiment. 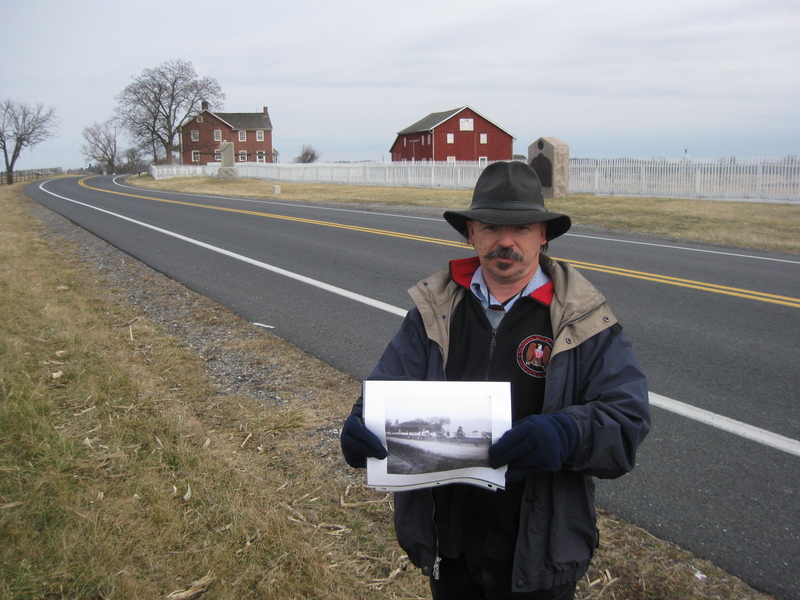 The picture that he is holding shows a trolley on the route that needed to be used to put the “outbound” tracks on the Emmitsburg Road. This view was taken facing west at approximately 2:00 PM on Friday, January 2, 2009. 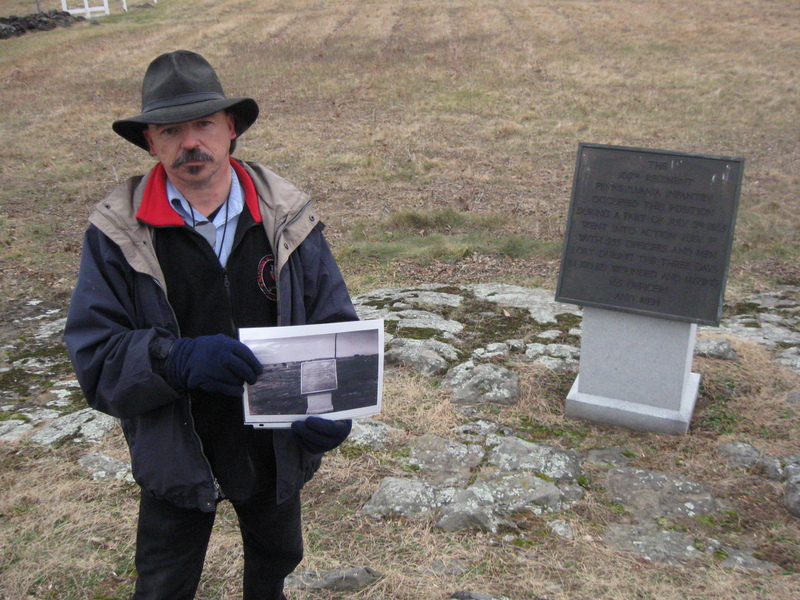 In Video #12 (Videos 1-11 were featured on our first two trolley posts), Rich is standing west of Hancock Avenue near the marker to the 107th Pennsylvania Infantry Regiment. The Brian Barn/Bryan Barn is behind him. He will show how the trolley will access the Emmitsburg Road from this point. Pay no attention to the wonderful camera work that missed zooming directly on the monument to the 8th Ohio Infantry Regiment. We found it eventually. This view starts by facing southwest until we turn to a couple of directions at approximately 2:00 PM on Friday, January 2, 2009. Here is the photograph that Rich showed us in Video #12. The marker to the 107th Pennsylvania was placed here in October, 1913. The trolley has made its turn and is heading towards the Emmitsburg Road near the monument to the 8th Ohio Infantry Regiment. 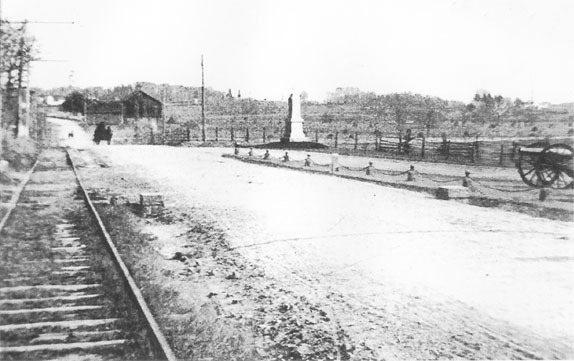 The 8th Ohio is the white monument ahead (west) of the trolley. This photograph is courtesy of the National Park Service. This view was taken facing west between October, 1913 and 1916. In this view taken from the top of the Ziegler’s Grove Tower on Cemetery Ridge, the subject is construction of the the encampment for the 1913 veteran’s reunion. However, at the bottom of the photograph, one sees a trolley making a left on the Emmitsburg Road, at a location just southeast of the monument to the 8th Ohio Infantry Regiment. This photograph is courtesy of the National Park Service. This view was taken facing southwest in June, 1913. Rich is standing north of the Codori Farm, which is out of sight behind the camera. 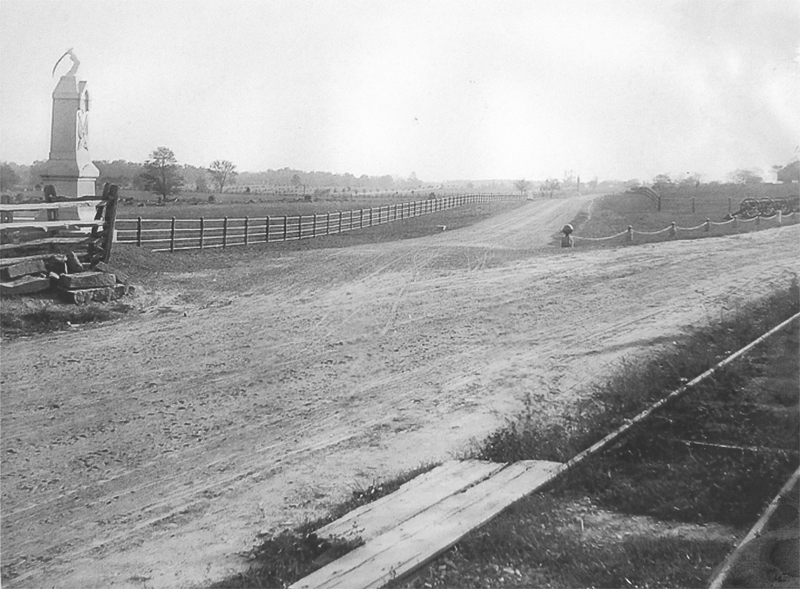 The trolley continued down the west side of the Emmitsburg Road, across the Pickett’s Charge fields. 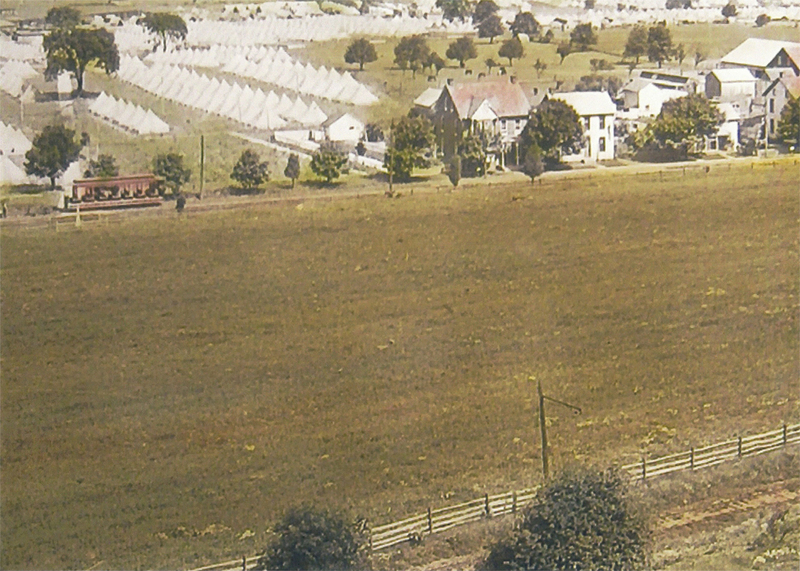 At one time during its existence, the trolley had an option of turning off the road at this point, and heading across the fields toward the Round Tops. It would use a railroad line located here. This view was taken facing north at approximately 2:00 PM on Friday, January 2, 2009. In video #13, we begin with Rich pointing towards the Brian Farm to the northeast. Rich explains the trolley’s relationship with the railroad at this location. This view was taken facing northeast to north to a couple of other directions at approximately 2:00 PM on Friday, January 2, 2009. 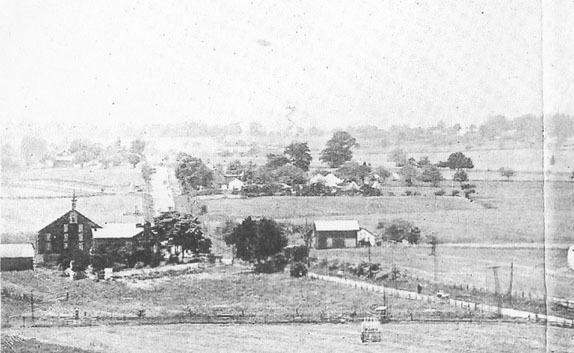 Here is a photograph of the Pickett’s Charge area around the time of the 1913 Reunion. The large white tent, or Great Tent, hosted the larger meetings for the 50,000 veterans who attended the reunion. But there are some interesting features relating to the trolley which we will show you in the next picture. This photograph is courtesy of the National Park Service. This view was taken facing southwest in June, 1913. 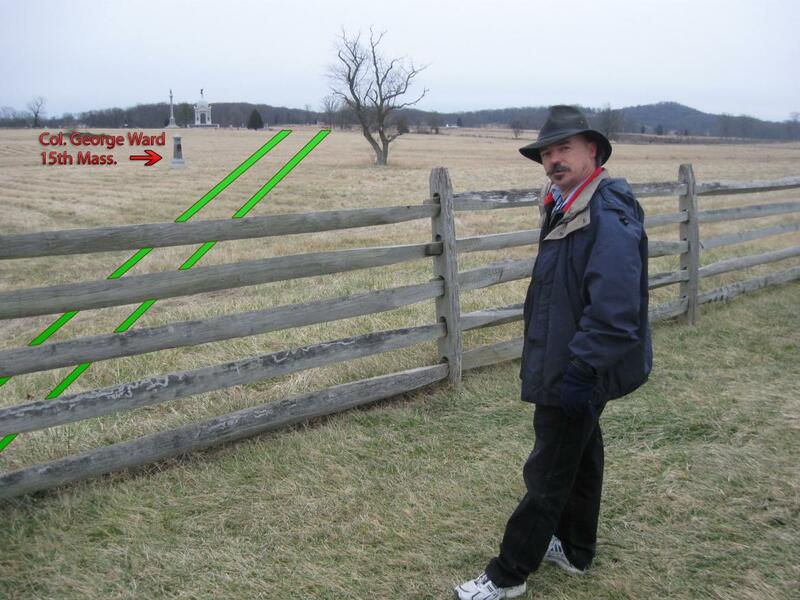 The green line represents the Harrisburg and Reading Railroad line which ran across the Pickett’s Charge fields towards the Round Tops. The white star is where we filmed video #13. We have pointed out a trolley on the Emmitsburg Road and a railroad car on the tracks west of the Emmitsburg Road. This photograph is courtesy of the National Park Service. This view was taken facing southwest in June, 1913. Here is a detail from the previous photograph. This photograph is courtesy of the National Park Service. This view was taken facing southwest in June, 1913. Again, the green line is the railroad line. 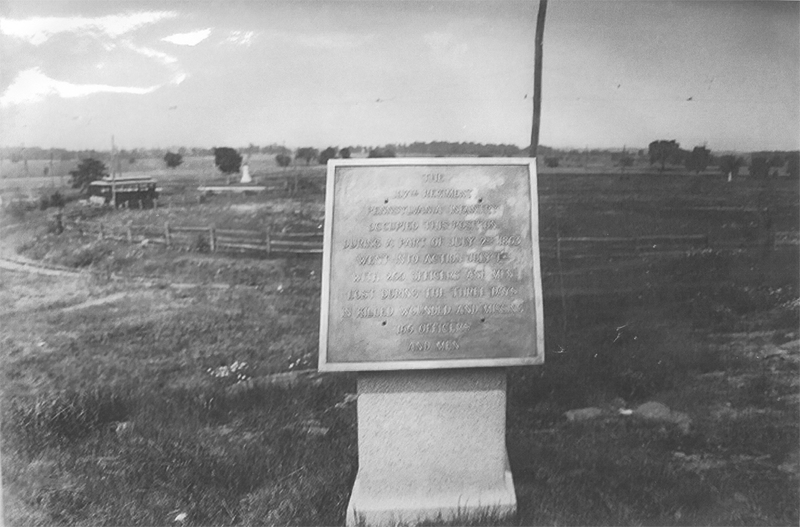 At the bottom left is the monument showing where Colonel George Ward of the 15th Massachusetts Infantry Regiment was killed on July 2, 1863. We have also pointed out two poles. The trolley would have had electrical poles on the railroad tracks, but we don’t believe the trolley was operating on the railroad line as late as 1913. These might have been trolley poles that were not taken down after the trolley could no longer use this line. Another possibility is that these could have been telegraph poles used by the railroad line. We couldn’t resist showing the Klingel Farm with very large trees only 50 years after the battle. In October, 2008, the National Park Service cut down some large trees here insisting that there was an orchard in their location at the time of the battle. This photograph is courtesy of the National Park Service. This view was taken facing southwest in June, 1913. We are near the intersection of the Emmitsburg Road and the Harrisburg and Reading Railroad line. Little Round Top is just above Rich’s hat. This view was taken facing southeast at approximately 2:00 PM on Friday, January 2, 2009. We have added some graphics to the previous picture to show the general direction that the railroad line was placed on its way to the Round Tops. The George Ward monument is clearly visible here. This view was taken facing southeast at approximately 2:00 PM on Friday, January 2, 2009. Rich is standing on the west side of the Emmitsburg Road by the site of the Rogers’ Farm, and the monument to the 1st Massachusetts Infantry Regiment, which was dedicated on July 1, 1886. This photograph was taken facing southwest at approximately 2:00 PM on Friday, January 2, 2009. The trolley tracks are clearly visible in the foreground, and there are two possibilities here. It appears that the ground had recently been disturbed on the other (west) side of the trolley. That would lead to to believe that this picture might have been taken soon after the trolley tracks were laid. However, a closeup of the trolley tracks appear to show that they have been heavily used. So it might have been taken near the end of the trolley’s lifetime. This photograph is courtesy of the National Park Service. This view was taken facing southwest between 1893 and 1916. 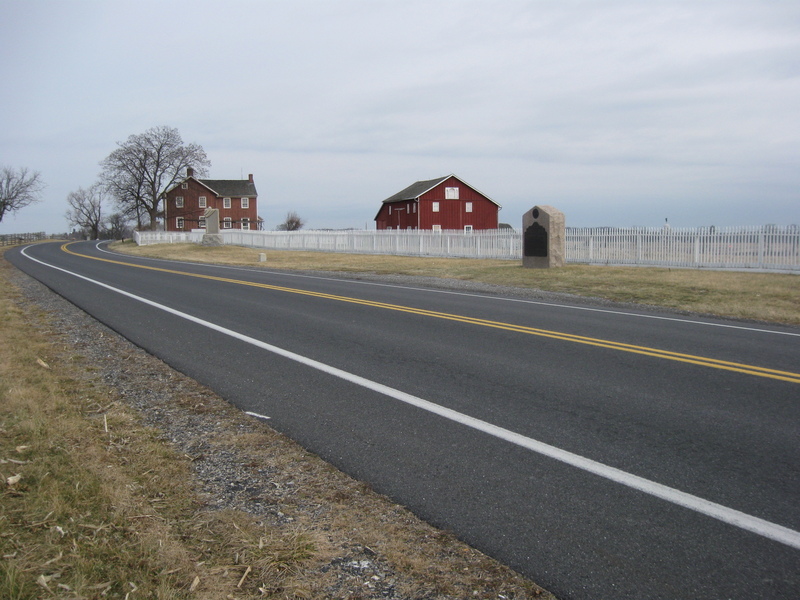 On the east side of the Emmitsburg Road is its intersection with Sickles’ Avenue. 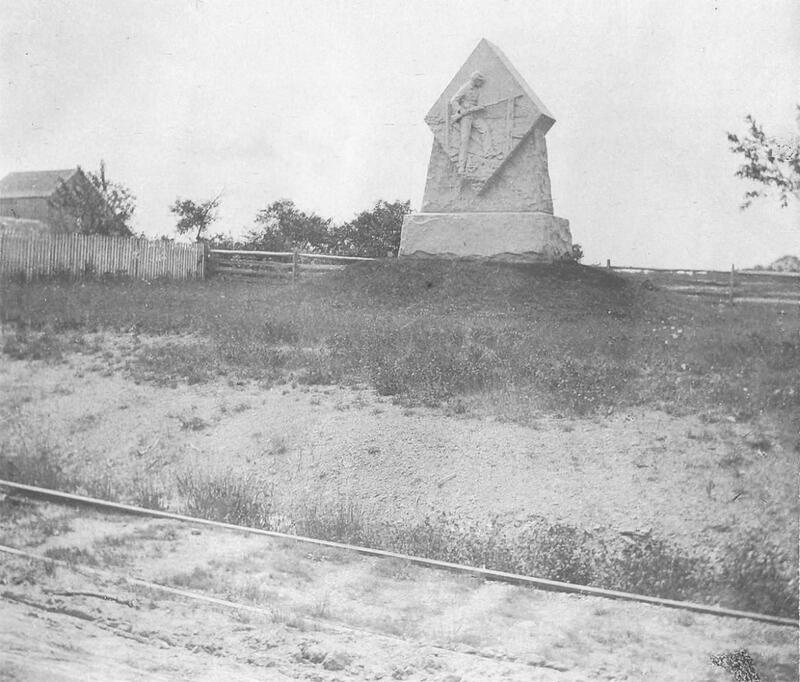 The monument to the 11th Massachusetts Regiment, on the left, was dedicated on October 8, 1885. It was vandalized on February 16, 2006. This photograph is courtesy of the National Park Service. This view was taken facing southeast between 1893 and 1916. We are looking northeast along the Emmitsburg Road near its intersection with Sickles Avenue. The monument to the 11th Massachusetts Regiment is clearly visible on the right (east) side of the road. The monument to United States Brigadier-General Andrew Atkinson Humphreys has not yet been erected. It was dedicated in Autumn, 1914. This view was taken facing northeast between 1893 and the summer of 1914. This photograph is courtesy of the National Park Service. We’ve climbed the Emmitsburg Road near the Klingel House and have turned around to look back (northeast) toward Cemetery Hill. The Ziegler’s Grove tower is clearly visible in the distance above the Emmitsburg Road. 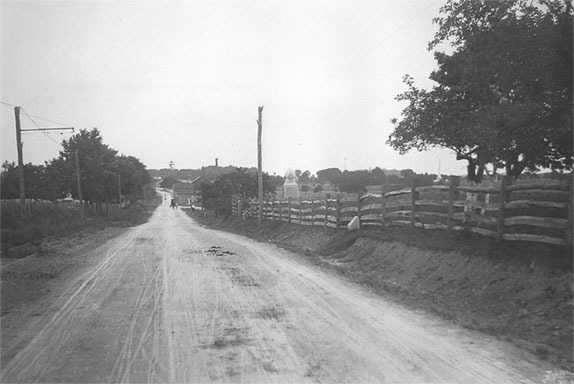 Sickles’ Avenue, intersecting with the Emmitsburg Road is visible at the bottom of the hill by the carriage. The trolley tracks are on the left. On the east side of the Emmitsburg Road, to the right of the pole, is the monument to the 16th Massachusetts Infantry Regiment, dedicated on October 8, 1885. This photograph is courtesy of the National Park Service. This view was taken facing northeast between 1893 and 1916. We’re now southwest of the hill near the Klingel Farm. There is a lot of room on this near (west) side of the Emmitsburg Road, and Rich will tell us why in the following video. This view was taken facing northeast at approximately 2:00 PM on Friday, January 2, 2009. In video #14, Rich explains that because the trolley company could not have their vehicles travel in a one-way loop around the field, they sometimes had to use the same tracks. In three areas of the field, double tracks were constructed so that the trolleys could pass each other going in opposite directions. Here is where the first of the double tracks was located. This view was taken facing northeast to other directions at approximately 2:00 PM on Friday, January 2, 2009. Here is the photograph Rich showed in Video #14. The double tracks are at the bottom of the picture. The artillery monument is to Seeley’s Battery K, 4th U.S. Artillery, and was erected between 1907 and 1908. The monument to the 11th New Jersey Infantry Regiment, visible closer to the Klingel Farm, was dedicated on June 30, 1888. This photograph is courtesy of the National Park Service. 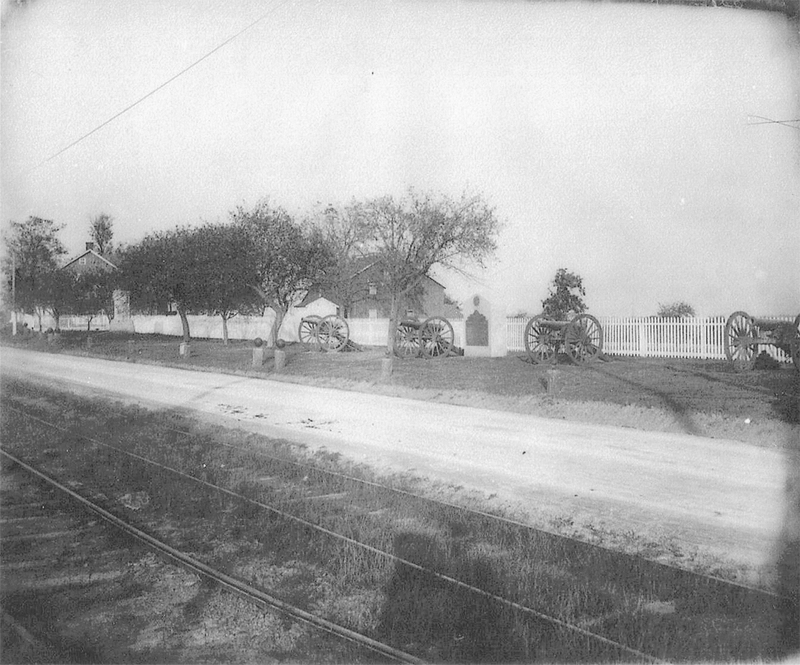 This view was taken facing northeast between 1907 and 1916. 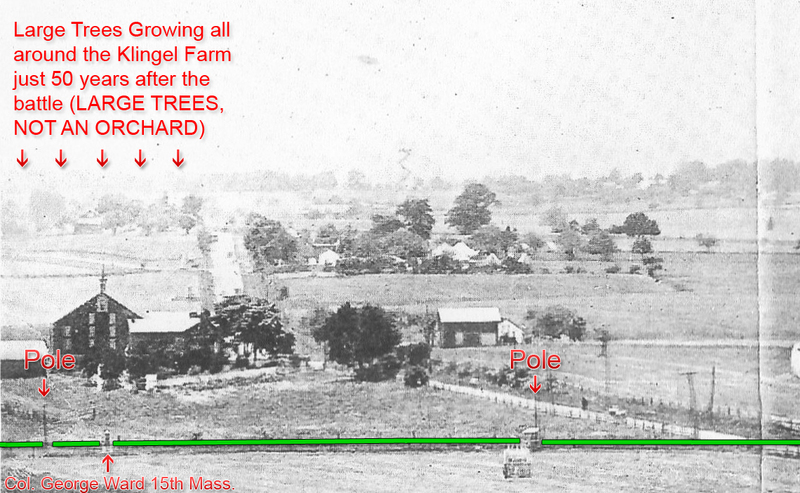 Here is a modern view of this passing area by the Klingel Farm. This view was taken facing northeast at approximately 2:00 PM on Friday, January 2, 2009.